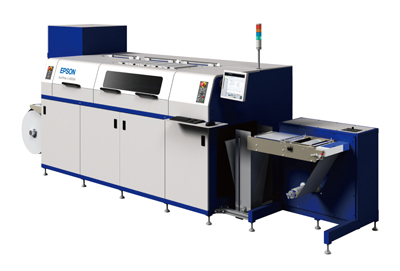 TOKYO, Japan - Epson today announced that sales of its SurePress inkjet digital label press had reached one hundred worldwide. The hundredth unit was installed by Kanae Co., Ltd., based in Nagano, Japan. SurePress achieves magnificent color reproduction on a wide variety of label substrates thanks to Epson's original Micro Piezo inkjet technology and original soluble inks. It has also been praised by customers for its usability, easy maintenance and its stable printing quality. As many as 20% of SurePress customers have purchased two or more units. "We are committed to contributing to the profitability of our customers' businesses," said Eisuke Shimoyama, general manager responsible for sales and marketing of industrial solutions at Epson. "We will launch a new model that includes a print head using our cutting-edge PrecisionCore technology. Going forward, our aim is to expand our market share and lead the digitalization of the printing industry." Epson's SurePress has received high praise from customers, including the following. "We were urgently considering investing in a digital label press and chose SurePress because of Epson's typically fantastic color reproduction, the reasonable price, and Epson's reputation for reliability," said Tsuneki Arihara, president. "We were also impressed by Epson's response and felt they would be able to answer our needs going forward. SurePress is contributing greatly to the efficiency of our business and believe that the savings we have made in productivity have more than justified the outlay." "We have been using the Epson SurePress L-4033A digital label press for nearly a year and a half now, and we have been incredibly happy with both the vibrant, high-quality labels we are able to produce, as well as the exceptional service that we've received," said Chris Martin, vice president and co-owner. "We've had customers come to us that tried printing complex labels using a competitive digital press, only to have color and consistency problems. Using the Epson SurePress, we are able to print those labels with ease. SurePress helps us deliver a high quality product to our customer, and when our customers are happy, we are happy."